Pete and I just got back from the beach (a stroll to freshen our minds, as we’re both working today) and on the way back up from the water, we spotted a fish-like thing laying on the sand and seaweed. I new immediately that it was a dead baby shark. We gave him/her a rinse in the freshwater river that leads to the sea, named him/her Rodney, and I’ve decided to chuck him in the freezer. For what purpose, I don’t know, but I’m about to be able to say I’ve got a whole shark in my Beko. 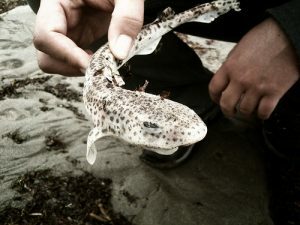 And in case you’re wondering– I have identified Rodney as a Smallspotted Catshark. Nope, I didn’t make that up. I found it on Shark Trust. For completeness, we also found an eggcase, but assumed it was weird seaweed/plantlife as it was wrapped up in a pile of seaweed. We love living by the ocean. I think in the UK we generally call it a lesser spotted dogfish, Scyliorhinus canicula, a very common fish in our waters – just ask your local fishermen!